Pills and Powders: a blessing or a concern? ‘This exhibition shines a spotlight on medicinal products and their use, both in the past and in the present. 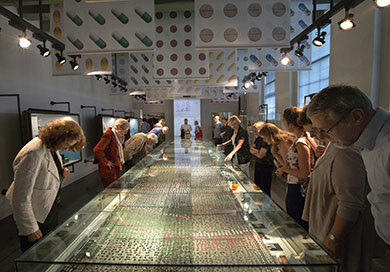 The centre of attraction is the artwork entitled Wieg tot Graf an 8-metre long table displaying all the medication an average Dutchman is prescribed over the course of a lifetime. The medicinal products are accompanied by family photographs and objects. They bear witness to vitality and decline, to moments of happiness and concern everyone has to deal with. Wieg tot Graf astonishes and fascinates, but it also raises critical questions about the use of medicinal products and views on health and care. The artwork is surrounded by objects associated with the rich history of medicinal products. There is an apothecary’s jar from the 18th century with Requies Puer, a commonly used medicine containing opium which was used to pacify hyperactive children. A precursor to today’s ADHD medications, perhaps? Another apothecary’s jar on display was used to hold mercury. Until the 19th century, doctors prescribed large doses of mercury for the treatment of the venereal disease syphilis – not surprisingly, this had its share of side effects (which at the time were seen as signs of the infection itself). The exhibition also features old pillboxes, a medical amulet, medicinal weights in the form of drams, advertisements for Softenon (thalidomide) and coloured medicine bottles. Interactive games prompt visitors to reflect upon current issues regarding the use of medicinal products.